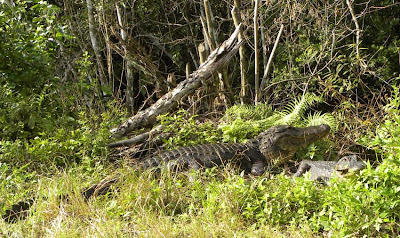 Yesterday at o'dark-thirty, Bill and I along with my favorite sister, Beth, headed south to the Everglades. Beth had just taken her hubby, Warren, to the airport so he could hurry back to Rochester, New York just in time for the year's first blizzard. 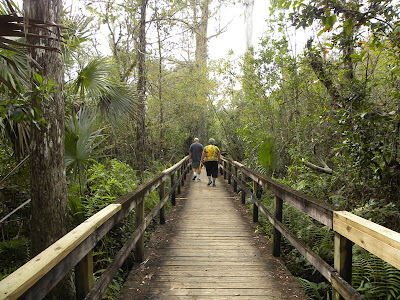 We started our sight-seeing adventures on Janes Memorial Scenic Drive - an 11-mile dirt road off Route 29 at Copeland - through part of the Fakahatchee Strand Preserve. 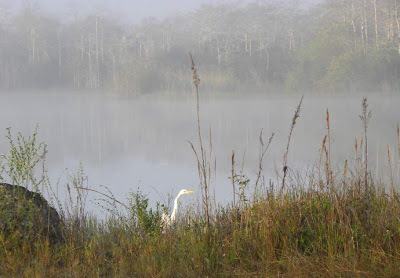 It was foggy early in the morning, but the sun quickly burned through the moisture to produce a picture-perfect day. This was the day of the hawks. 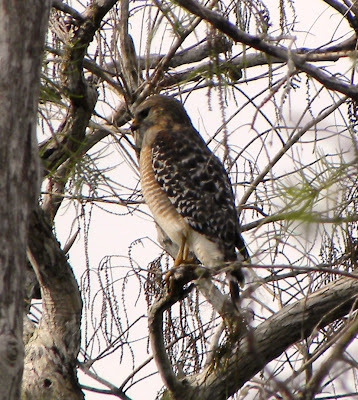 It's easy to see them when they are out in the open, but we spotted several of these beautiful raptors even when they were well camouflaged in the dense woods. 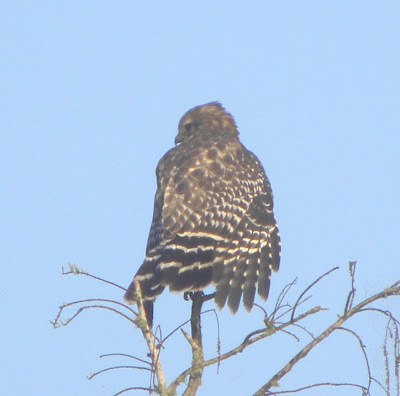 This photo is of a Red-shouldered Hawk who was drying his wings before taking off in search of small rodents. You can see there was still some fog. 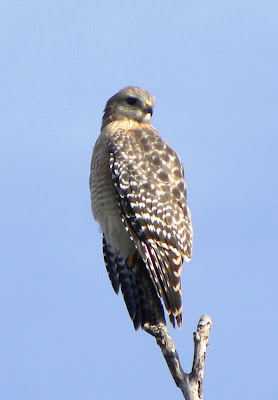 Another beautiful Red-shouldered Hawk - posing under the crystal clear blue sky. This was quite a surprise. We saw something up ahead that, from a distance, looked like a large branch. It was actually two alligators crossing the road. 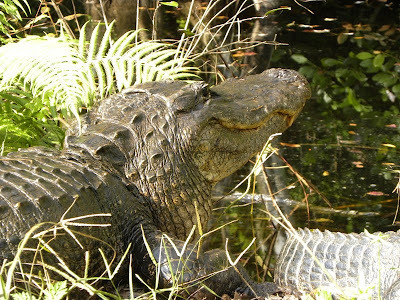 The larger one was about 8-feet long. We did not get out of the car when we pulled up alongside them. This is the larger of the two friends. 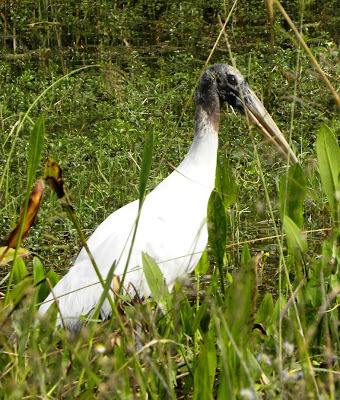 Wood Storks are endangered here in the U.S. so protecting them, especially during breeding, becomes an important issue at the preserves we visit. Storks may skip a breeding season or desert their eggs if there is too much or not enough rain, effecting the supply of fish. 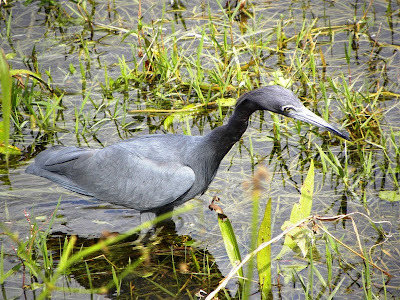 This Little Blue Heron was looking for lunch. 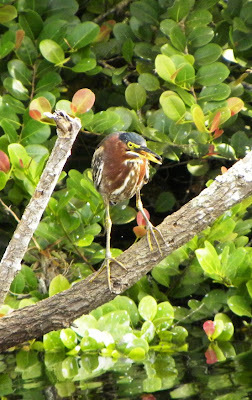 As was this colorful Green Heron. 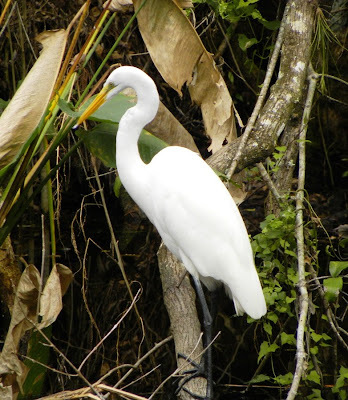 I take far too many pictures of Great Egrets - but they are so beautiful, I can't help myself. 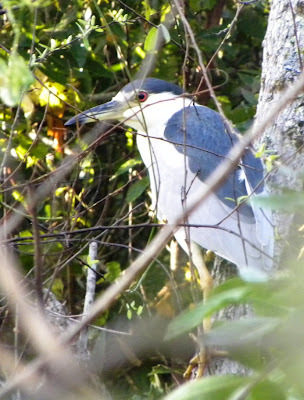 This is an adult Black-crowned Night Heron. 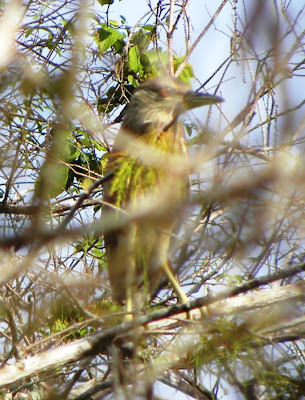 And this is also a Black-crowned Night Heron - only this one is a juvenile. We were so proud of ourselves - being able to spot birds hidden in the trees! 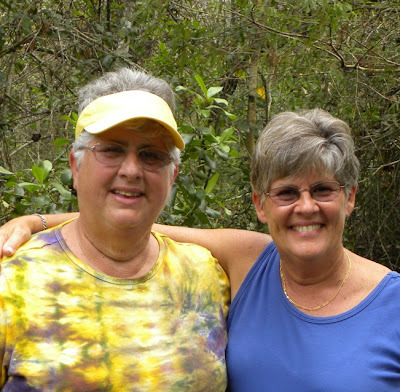 We took the lead from all the birds we saw - and stopped for lunch at our favorite Cuban Restaurant. The food is great. We eat outside so we can see the Brown Curly-tailed Lizards playing in the yard. Locals say that they blew-in from Cuba and the Caribbean during one of the hurricanes. 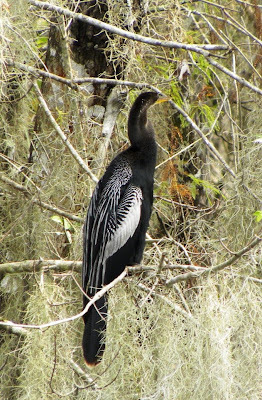 Another of my favorite birds - probably because he is so photogenic - an Anhinga. 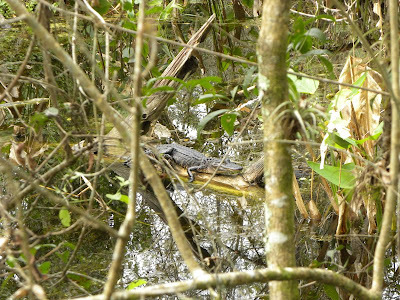 Look closely - there is a small alligator resting atop the log. He was about 3 1/2 feet long. 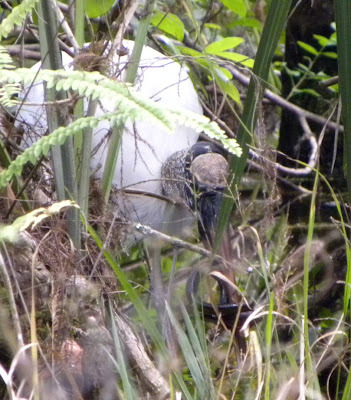 Walking along the boardwalk in another part of Fakahatchee - we saw this Wood Stork thrashing around and shaking his head. We thought he was trying to kill and eat a snake that he caught. It wasn't until I got home and enlarged my pictures that I could see that the snake had wrapped himself around the stork's bill and his neck. I'm not sure who had who - but I'm pleased to report we saw the stork later and he was free - but we don't know if the snake was lunch. 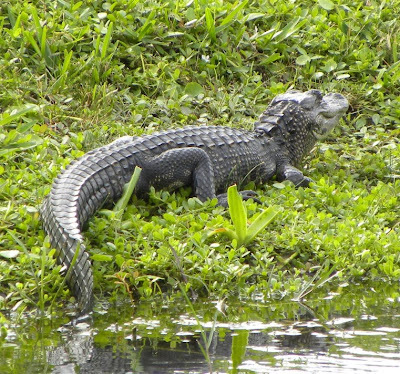 Another alligator - but this one was a baby. 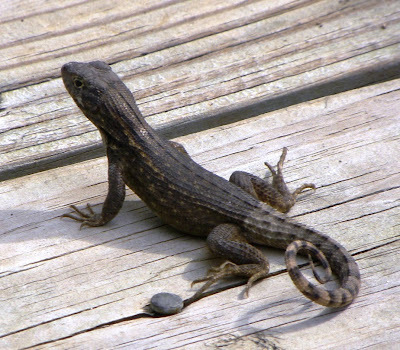 He was only about 18 inches long. Bill and Beth walking back on the boardwalk. We had a very full day and spotted all sorts of birds and animals. Our skills were honed! We could see a new variety in the distance while driving down the road at 60-miles an hour - which is how we saw the next very rare bird. 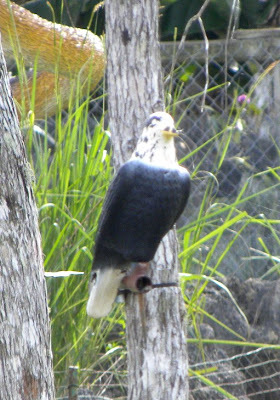 Bill made a quick u-turn and headed back so we could identify what we hoped was another life bird. When we stopped to take pictures, the locals started pointing and laughing. Why do you suppose that was??? ?